A guide to broadband networks available in the Hodnet area. There are many benefits to living in rural North Shropshire, but one of the drawbacks is the lack of a reliable fast broadband connection, even for those who live not so far out of a town or village. The increasing demand for many things to be done on-line puts many rural homes and businesses at a disadvantage. Work is being undertaken to meet the demand for better broadband, but it is not easy for residents to discover all the options which are currently available to them. 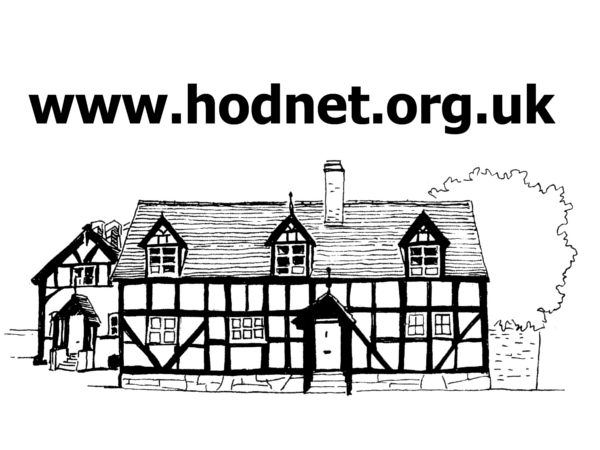 This page is intended to provide helpful signposts to present and future broadband solutions in the Hodnet area. A Shropshire Council initiative, Connecting Shropshire, is working to deliver superfast broadband [SFBB] to all premises in the county by 2020. SFBB was originally defined as 24 Megabits per second (Mbps) download but under the Next Generation Access [NGA] programme, 30 Mbps became the standard. Connecting Shropshire is responsible for making sure this programme is delivered, and information on what has been done so far along with an outline of their future objectives is available on their website. Funding has been made available by central government and the initial two phases of the work has delivered SFBB to over 62,000 premises in the Shropshire Council area. Commercial factors meant the bigger challenges were always going to be how to reach rural properties, where in many instances BT/Openreach’s combination of fibre and copper cable simply cannot deliver. In July 2017, Connecting Shropshire announced that Airband Community Internet Ltd would be the delivery partner for the next phase of Shropshire Council’s SFBB programme. Under “Contract 3”, the Worcester-based company accepted responsibility for delivering superfast broadband to over 14,000 homes and businesses in the Shropshire Council area within a three year time-scale. By the end of July 2018, Airband had completed Phase 1 of their contract, and locally this included a number of properties in Marchamley. What is unclear though is when the remaining properties in the Hodnet area will be able to receive a signal from one of Airband’s transmitters. An alternative local supplier of radio broadband is Telford-based company Userve. Those who are out of reach of both networks could consider using 4G mobile network broadband if they can receive a reliable signal – it is not clear when the promised 5G service will reach these parts. Several companies also supply satellite broadband, but this is expensive, has technical drawbacks and therefore is not as reliable as other broadband delivery systems. Radio broadband is now a well-tested and usually reliable service, generally delivering the speeds advertised. It is important to note however that these networks depend upon line of sight from the property to the local transmitter. It works over a distance of up to 20km from the transmitter, depending on a suitable receiver/transmitter at the connected property. Network providers normally supply and fit the required hardware. The network provider also acts as the ISP with no third party contracts currently being available, though this may change in the future. Below is basic information on what SFBB services are available in and around Hodnet as at the end of December 2018. Another fibre-enabled cabinet connected to the Hodnet exchange, is planned for High Hatton. At present no date is available for when this will be able to deliver SFBB if at all. It is often difficult to know whether your property is close enough to receive a reliable broadband connection even if you are connected to a fibre-enabled cabinet. The following links are to BT’s Broadband Availability checker: if you have a landline number, use this page; if you don’t, use this page. If you get a result which looks similar to the top screenshot (click to enlarge), it means you have access to fibre SFBB – the VDSL ranges show what speeds you should have access to. If you do not want to pay for SFBB, then the ADSL figure indicates the maximum and fixed (guaranteed) rates you should receive. If, as in the second screenshot only ADSL rates are listed, then fibre SFBB is not available on that line/at that address. N.B. Even when you have access to a SSFBB service, your choice of Internet Service Provider [ISP] may be limited as they do not all automatically install the necessary equipment in the local exchange. This is a commercial decision based upon demand for their products. Information about Airband’s service can be found on their website, though the information is limited if your post code is not already covered by their service. In that case you will not be able to find out about their products or when they will be able to provide a service to your property. On Connecting Shropshire’s Contract 3 – Airband page there is a map showing the coverage achieved by the completion of Phase 1 (July 2018), but because of the scale it is impossible to tell which properties may already be able to connect to their network. When one of their staff spoke at a meeting in Peplow in November 2018, they said that 30Mbps was guaranteed and that domestic packages started at around £10/month for 10 GB of data usage. The next package costs approximately £30/m and allows for a more significant amount of usage. Unlimited package and business accounts are also available. It is normal for radio broadband networks to charge for installation of the required hardware. In properties covered by Airband’s contract with Connecting Shropshire, this should be around £100; elsewhere it will be higher depending on the equipment required. At present their mast near Marchamley also provides coverage to some of the surrounding areas including a number of properties in Peplow. If you are interested to know more about their services, you can apply via their website, or call them on 01905-676121. Information about the uConnect wireless network can be found on the Userve website, where there is a map of the coverage provided by their network of transmitters. Their main transmitter is on the Wrekin, which covers a wide area reaching as far north as Espley Roundabout. 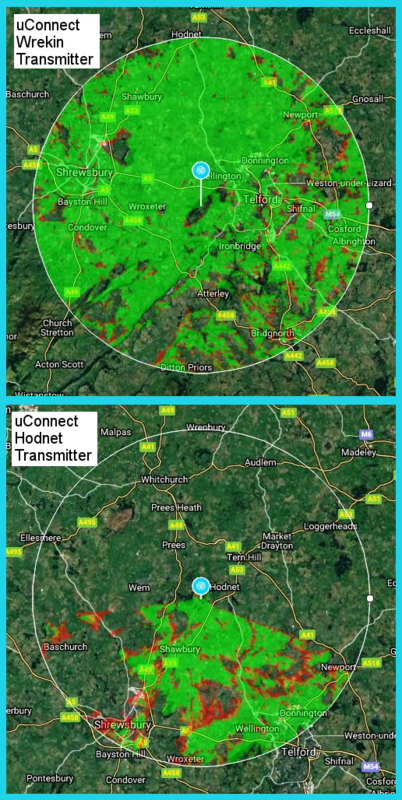 They have supplied us with more accurate computer-generated maps of their coverage; the top one is for the Wrekin transmitter (click to enlarge). They also have a transmitter above the West Midlands Shooting Ground at Hopton, which provides coverage to the south as shown in the second map. (The circle in both images represents a distance of 20km from the transmitter). They are actively investigating extending their network across the rest of North East Shropshire. Prices for the various domestic and business packages are shown on their website and vary in both data transfer rates and usage depending on the preferred contract, the cheapest being around £30/m with a 100Gb data cap. Installation costs are higher than those quoted by Airband, but at the time of writing those without access to publicly funded SFBB networks will almost certainly qualify for a significant subsidy under the Better Broadband Subsidy Scheme. The scheme is operated by Connecting Shropshire with funding from Broadband Delivery UK [BDUK]. To find out more apply via the above page, or call Userve on 0333-8000-873. Connecting Shropshire’s Alternative Broadband Solutions page lists other radio broadband suppliers, but they are not known to provide a service in this area. Business Broadband Grants are available and eligible businesses could qualify for a £25,000 grant to access a SFBB connection. Connecting Shropshire, in partnership with other organisations have developed the Marches & Gloucestershire Business Broadband Grant scheme. Details are available on their Business broadband grant page. Some mobile network supply indoor hubs/routers to enable broadband “at home”, but this depends on the strength of the signal – often not good in rural Shropshire. (N.B. It is possible to use a remote aerials mounted for instance in a loft). Each network provider’s coverage and costs are different. Information on the major provider’s coverage is available on Ofcom’s Mobile Availability Checker. As with mobile networks, each provider has different packages available. An introduction to how satellite broadband works, including an outline of the technology’s strengths and weaknesses, is available on the ThinkBroadband website. Data transfer speeds tend to be slower than wireless networks, and usage caps lower. For those in very remote locations however, satellite broadband may be the only workable solution. If you have questions after reading the above we suggest that you contact Connecting Shropshire. You can do so by phone on 01743 252203, by email or by writing to Connecting Shropshire, Shropshire Council, Shirehall, Abbey Foregate, Shrewsbury, SY2 6ND. The information on this page is correct to the best of our knowledge. If you have any corrections or updates, please contact the webteam.